I’m not going to make you read until the end of the review to find out that I loved this book. I loved it. I read Colin McCann’s Let the Great World Spin a few years ago and fell beautifully in love with his writing and storytelling. In Let the Great World Spin he uses the infamous tightrope walk executed by Philippe Petit in New York 1974 where literally the city holds its collective breath as they watch Petit dance between the World Trade towers. True story. He uses this historic event to weave together an incredible tale that connects a number of people who all witnessed this event. What emerges is a portrait of America post Vietnam. 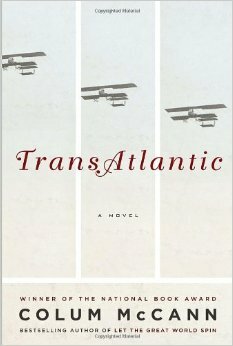 In TransAtlantic he does it again but this time he celebrates the connection between Ireland, America and Canada in a book that spans four generations. This time the historic event on which the remainder of the story turns is the first transatlantic flight by WW1 vets Alcock and Brown who are vying to win 10,000 pounds for being the first to carry mail from the New world to the Old by aircraft. In each chapter McCann introduces a new piece of the puzzle, and a character who plays a bit part in the previous chapter sweeps forward and takes centre stage. It sounds simple but it’s masterful. What emerges is a portrait of a generation of 4 women, Lily, Emily, Lottie and Hannah which spans from the mid 1800’s to 1998. Each of these women interact with known historic male figures – the African American slave Frederick Douglass, (he travels to Ireland in 1845 to advocate for the abolishment of slavery), the aviators, and Senator George Mitchell, who brokered a peace deal for Ireland in 1998. The interactions with these men provides the historic framework on which the novel rests and through it we travel through time, from Ireland in the 1840’s through to the Civil War where Lily Duggan escapes to work as a nurse. The reader weaves through history and place through the emotional lives and history of Lily Duggan and her daughter and granddaughters. For those of you wanting more rave reviews Lawrence Hill wrote this for the National Post – a great writer writing a review of another great writer’s book. Sounds great! I’m adding this one to my reading list.